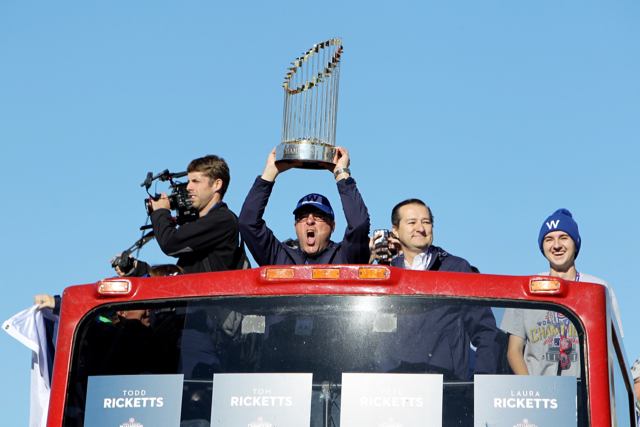 Wednesday was a big day for Todd Ricketts. The Chicago Cubs, the team his family owns, won its first World Series Championship since 1908. And 45Committee, a conservative political nonprofit he runs, spent nearly $13 million on ads attacking Hillary Clinton, according to a report it filed with the Federal Election Commission. The ad buy is unusual for two reasons. First, members of the Ricketts family, including Todd’s father, Joe, the founder of TD Ameritrade, were initially opposed to Donald Trump’s candidacy, instead backing Scott Walker. Second, according to The Center for Responsive Politics, only five dark money organizations — groups that are not required to reveal their donors — have spent more than $12 million during the entire election cycle. Prior to Wednesday, 45Committtee had spent $7 million on the 2016 race. With its latest ad buy, the group became the third-highest-spending dark money organization this election cycle. Ricketts has reportedly helped raise $30 million for the group and a pro-Trump super PAC, Future45. According to Politico, Ricketts has been encouraging wealthy donors to use 45Committee as a vehicle to support the Trump campaign if they don’t want to be publicly associated with the GOP nominee. According to The Guardian, Joe Ricketts has contributed $1 million to the group and Sheldon Adelson, a conservative megadonor, pledged $25 million. In addition to 45Committee, Todd Ricketts is president of Ending Spending, another dark money organization. His father is the group’s founder and chairman. Ending Spending has poured almost $2.5 million into Congressional races this cycle. Todd and his father aren’t the only members of the family involved in politics. Pete, Todd’s brother, is Nebraska’s Republican governor. Laura, their sister, has been actively supporting Clinton, hosting a fundraiser for her and contributing hundreds of thousands of dollars to the pro-Clinton L PAC.